UK launch of Square Reader will greatly help small businesses looking to grow, company tells ITProPortal. British small businesses looking to expand have been given a major technological boost thanks to a new launch from Square. The payments firm has now launched its Square Reader in the UK, allowing small businesses to accept payment via contactless payment cards or mobile devices as well as through chip and PIN-enabled devices. The £39 reader is small and stylish, weighing in at just 56g, meaning it can be handheld, or tethered to a till or counter using an additional £19 dock. Square also charges a low amount per transaction, with customers paying just 1.75 per cent for each transaction made in person with Visa, Mastercard or American Express, Apple Pay or Android Pay, and 2.5 per cent for phone and online payments. Speaking to ITProPortal this week, Sarah Harvey, the UK lead for Square, said that the “truly mobile setup” of the reader offers unparalleled flexibility for small businesses. Merchants registering with Square can get approval to start using the system within the hour, taking much of the headache out of setting up a new payments platform, with Square’s own software system offering a POS service as well as in-depth analytics. Transaction payments are also settled faster than other equivalent systems, with Square normally settling the next business day, meaning businesses get their money faster. The Square Reader costs just £39. Square, which launched in the UK back in March, but originally began in San Francisco in 2009, is now looking to expand its business across the country, embarking on a major marketing push, although Harvey notes that word-of-mouth is also playing a huge part. The company estimates around three million of the UK’s 5.4m small businesses don’t currently take card payments, meaning there is a huge opportunity for expansion - and to enable SMBs who only accept cash to get more sales. 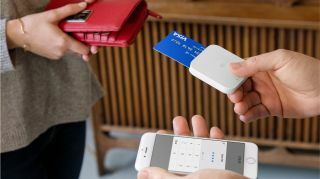 Another advantage of Square’s mobile setup is that it allows start-ups and small shops to expand their payment options, an aspect which is especially critical as more and more consumers stop using cash altogether. Square also recently released research that showed this flexibility is key to ensuring a brighter future for Britain’s small businesses, more than than seven in 10 of whom said they were confident about the UK business environment, despite economic uncertainty and worries over Brexit. Surveying 1,200 small business owners owners across the UK, the study also found that on average, they expected their company to grow by 29 per cent over the next 12 months, with increasing use of new technology named as one of the major catalysts behind this.